“It happened that when Moses and his people were journeying through the desert, they met with a nobleman from Scythia who did a good deed for Moses in regard to the location of food. That very night a snake came, entered the Scythian’s tent and wounded the Scythian’s young son in his bed. His father took the boy to Moses whose camp was near at hand. Moses applied his rod to the wound and healed him. Moses promised him that they would find an island where neither snake nor serpent lived, and this island could be found by following the setting sun. Moses gave the youth a golden torque, or collar, in the form of a snake and told him to wear it on his neck always in memory of the miracle, and the promise that Moses made. The youth came to be called Gael Glas, on account of the torque he wore, the Gaelic word Glas meaning a lock, or locket. The Scythian nobleman resolved to find this island which was free of snakes, but it took a generation or two for his descendants to discover it. The Scythians, it must be understood, possessed education and learning of the sciences earlier than the Egyptians or the Greeks. The scythian cured by Moses was the progenitor of Clann MacEgan. Before the introduction of the coats of arms the family emblem was incised on their shields. The version of the coat of arms associated with the MacEgan family of Ballymacegan has quartered arms, the second and third quarters may have been incorporating a coat of arms belonging to another family, probably on the occasion of a marriage. The second coat was identical with the first quarter, that is a white tower between two men in armour, bearing battle axes with a golden snake on the top. The chief to whom this second coat of arms was granted was Darby Egan of Ballymacegan and he retained the golden snake. The Latin motto “Fortitudo et prudentia” means fortitude and prudence. As there are no snakes or serpents in Ireland, the newt, a small tailed, lizard-like amphibian found in marshy places, and a relation of the snake, was assumed as the totem or emblem of the family. This newt is a harbinger of approaching death, appearing in the home of the oldest family member, (much the same as the banshee is a harbinger of death to other Celtic families). It is know that the newt has shown itself in more recent times. It is also believed that these, our first ancestors, arrived in Ireland by their own ways and means, not in the company of invading forces. In time the Melesians accepted and welcomed them, because actually they were of the same family line and spoke the same language. As the sons of Gael Glas had a good knowledge of learning, they were put in charges of the schools of astronomy and other known sciences. 1. 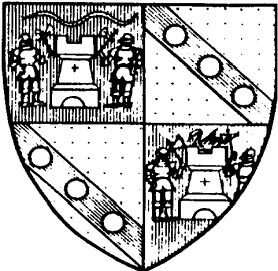 These below, are perhaps the oldest known Egan armorial bearing; although they most likely pertain to the family Connaught, they are considered the universal Egan arms. 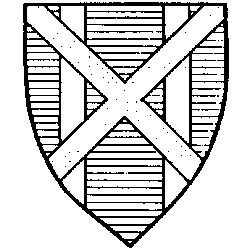 They consist of two palets argent over a saltire or crest, with a cross of cross patriarchal gules. 2. These below, are the arms of Patrick Egan, Esquire, of Annamaidel, Tipperary, dating from the reign of Charles I, 1625-1649. They consist of a gules of a tower argent supported by two men in armor, their exterior hands resting on their hips, and their interior hands holding a halberd, with a snake on top. 3. 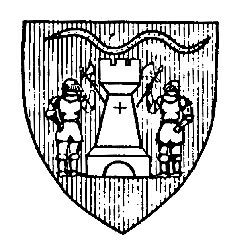 These below, are the arms of the Ormond family, who in the 1700’s concentrated their holdings in Ballmacegan and became known as the MacEgans of Ballymacegan. In Genealogical Office MS.103, page 18, may be found the official record of the Ballmacegan arms. They were confirmed on July 28, 1715, to “Darby Egan, Esq., son of Carby McEgan of the same, Esq.” As to the quarters: 1st, gules of a tower argent supported by two knights in complete armor, holding in their interior hands a battle-axe, with a snake barways at the top; 2nd and 3rd, on a bend vert with three plates; 4th, gules on a tower as in the first quarter, a swan on the argent. Crest: on a tower, a knight in complete armor couped at the knees, holding in his dexter hand a battle-axe. Motto: “Fortitudo et Prudentia,” that is “Fortitude and Prudence.” (Incidentally, the knights in armor, as they are depicted in the manuscript drawing, appear to be gallow glasses. 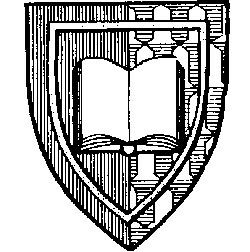 Since these arms appear on the 1689 Egan memorial in the Dominican Priory, Lorrha, they were obviously in use long before the official confirmation. The Constance and John Egan mentioned in the grant are without doubt the same Egans who erected the mural tablet in Lorrha Pirory. Sometimes the motto of Ballymacegan arms is given as an ablative: “Fortitudine et Prudentia,” that is “With (or “in”) Forittude and Prudence.” The Latin motto accompanying both arms at Lorrha and those in the Genealogical Office is, however, in the nominative case. 4. These below, the latest of the Egan arms, are the armorial bearing of Michael Joseph Egan, B.A., LL.B., Knight of Malta, Pilgrim’s Cross, Jerusalem – of Mountain View, Castlebar, County Mayo, and of Redwood Castle, County Tipperary. They are an integral part of the official seal used by Michael Egan in his capacity as Notary Public. Genealogical Office MS. 110, fol. 75, contains a copy of the grant of these arms to “the descendants of Michael Egan of Curraghore and to his great-grandson Michael Joseph Egan of Castlebar, Solicitor, son of Michael Joseph, Mayo County Manager, son of Thomas Egan of Glenisland, all in County Mayo.” The grant is dated July 4, 1957. 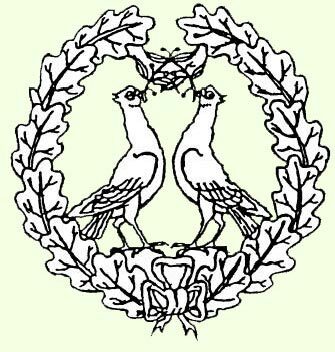 Although the meaning of the insignia and devices on the older Egan arms is now largely a matter of conjecture, the symbols pertaining to the coat of arms of Michael J. Egan and designed for him by Chief Herald Gerard Slevin, can, of course, be fully interpreted. According to pal gules and vair, the Egan arms consist of an open book within an orle or crest: A hand erect couped at the wrist, holding a patriarchal cross, also erect, or Motto: “Ciall agud Ceart,” that is, “Prudence and Justice.” The gulessignifies the blood of martyrs and commemorates the sacrifices of Owen MacEgan and Boetius MacEgan, the heroic seventeenth-century bishops of Ross. The vair, or fur of a blue-backed squirrel with white underside, recalls the high office the Egans held as ollaves and brehons. 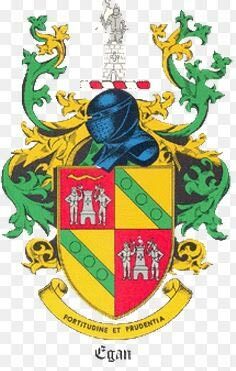 The orle, or the border of gold inside the shield, in these arms symbolizes the collar of Morann the Just, the great, half-legendary brehon of early Ireland, who wore it to safeguard unfair judgment, his collar would tighten around his neck, to loosen again on delivery of the true one. Morann’s judgment collar, also called IodhMorainn, a gift according to a beautiful legend in The Book of Ballymote, to the noble brehon from the Apostle Paul, connotes the hereditary legal calling of the Egans. The open book within the orle represents the learning of the family and, in particular, An Leabhar Breac. The hand grasping a patriarchal cross, such a cross is the crest of the oldest Egan coat of arms – suggest defense of the faith, but also the many illustrious churchmen and Catholic lay scholars who have the surname. The motto of the arms, an Irish variant of the Latin motto of the Ballymacegan arms, emphasizes once again the Egans command of Irish Law and their professional integrity. The image below is a casting made from an actual impression taken from the Egan memorial at the 13th Century Dominican Priory at Lorrha, County Tipperary. The memorial was carved by Patrick Kerin and states (in Latin), “Pray for the souls of Constantine Egan, gentleman, and his son John, who erected this monument for themselves and their descendants. The 4th day of October A.D. 1689.” The castings have been painted to resemble the original stone. 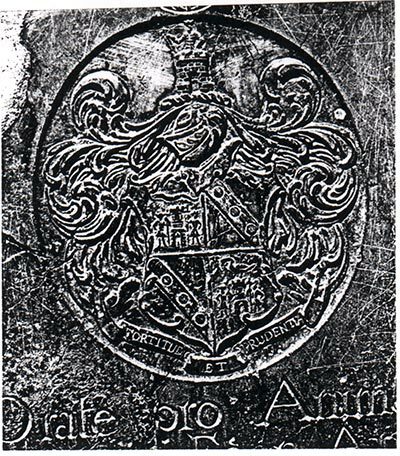 This coat of arms was in use by the Egan family from at least the early 1600s. There is a similar coat of arms to be seen on the memorial of Briget Egan, who died in 1833, at St.Mary’s Abbey, County Mayo. The snake refers to Gael Glas, ancestor of the clan who was bitten by a snake as a child and so set out for Ireland, a country where there were no snakes. The lion is a common charge in heraldry. It traditionally symbolises bravery, valor, strength, and royalty, since traditionally, it is regarded as the king of beasts. The crescent moon suggests the person awarded these arms was his father’s second son. This shield has classic “tincture” (coloring) – background is a “color” (they can be either blue, red,purple, black or green) and the devices (ie the lion, crown and moon) are all “metals” (either gold or silver/white).